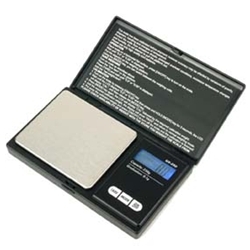 This BRAND NEW US-250 digital pocket scale manufactured by US Balance features a blue backlight and easy 3 button controls. This versatile unit is perfect for measuring herbs, spices, even jewelry, and the flip down top makes for a protected all-in-one unit when you're on the go. - Overall Size: 5.125" x 3" x 0.875"
- Platform Size: 3" x 2.5"